Kerala destination Alappuzha is blessed with exceptional natural beauty and famous for amazing Backwaters. It is interlocked by a number of canals and bridges. Alapuzha (Alleppey) is known as the “Venice of the East”. The Vembanad lake spread over 204 sq.kms. stretches from Alappuzha to Kochi and the Kayamkulam lake extends to the Districts of Alappuzha and Kollam. These lakes are widely used for the inland water transport. Alappuzha is also famous for Boat Race, Houseboats, Beaches, Mullakkal Rajarajeswari Temple, Marine products and Coir industry. 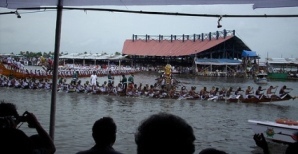 The spectacular Snake Boat Races are unique to the beautiful land of Kerala. Alappuzha Beach – This beautiful beach has an old lighthouse and 1,000 ft. long pier built in 1862, by Captain Hugh Crawford. Entertaining facilities like Vijaya Beach Park, Seaview Park with boating facilities and a swimming pool are there. Nehru Trophy Boat Race -The world famous Nehru Trophy Boat Race is held here annually on the second Saturday of August at the Vembanad lake.The highlight of this prestigious event is “Chundan Vallam”. This majestic boat is a 100 feet long snake boat, with more than 100 rowers,4 helmsmen and 25 cheer leaders decorated with colorful silk umbrellas. This event is witnessed by thousands of spectators from all over the world from the banks. The starting point of this race is the Punnamada Kayal. Alappuzha-Kollam Backwater trip – This journey organized by ATDC, begins at 10.30a.m. and reaches Kollam at 6.00p.m, passing through exotic locations. This waterlogged village is the place of oldest market known as Kalloorkadu angadi. The St. Mary’s Church built in 427 AD, with beautiful mural paintings, is another major attraction. You can also see the famous Champakulam Snake Boats which participate in the annual snake boat races. Edathua Church - Located 24 kms away on the Alappuzha - Thiruvalla Road, is a great pilgrim center. Mullakkal Rajarajeswari Temple – This temple is set in the heart of Alapuzha town. The shrine here is Goddess Rajarajeswari and the main event is nine day “Navrathri” festival celebrated twice a year. Another important festival is “Thaipooyakavadi”. Ambalapuzha – Situated 14 kms from Alappuzha, is the Sri Krishna Temple built in traditional Kerala architecture, one of the most important Hindu pilgrim centres of Kerala. Ambalapuzha temple is famous for its “Palpayasam” a sweet milk porridge prepared every day as an offering to the deity. Chettikulangara Bhagavathy Temple - The main festival Bharani festival is held in February-March. Karumadi – Located 3 kms east of Ambalapuzha, this village is known for its 10th century Karumadi Kuttan statue. It is a black granite idol of Lord Buddha, the founder of Buddhism. Mavelikkara - 35 kms away Mavelikkara is famous for Sri Krishna Temple and palaces. Mannarsala – Located 32 kms away, near Haripad, is the charming ancient temple dedicated to Sree Nagaraja, the King of Serpents. Pathiramanal – Located in Vembanad lake, it is the first island resort of the State. It attracts rare migratory birds from various parts of the world. Kumarakom Bird Sanctuary - Interested to watch migratory birds? Siberian crane, waterfowl, ducks, moorhens, egret, kingfishers, and heron can be found here. Krishnapuram Palace - This famous palace is just 47 kms away from Kerala destination Alappuzha. Hotels in Alappuzha to enjoy trip in Kerala destination Alappuzha.